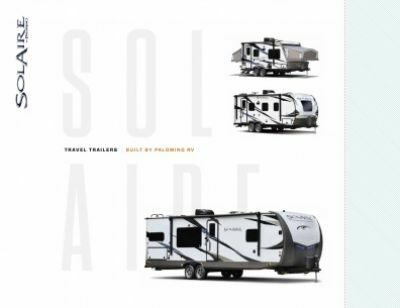 You'll love each and every moment in the 2019 Palomino SolAire Ultra Lite 202RB Travel Trailer! At National RV Detroit, we've been one of Michigan's top RV dealerships for over a decade! We sell the top brands in the world at wholesale prices, and we specialize in helping our customers find the RV of their dreams - like the 2019 Palomino SolAire Ultra Lite 202RB! We've got the nation's best price guarantee, so come in today and let our friendly, professional staff help you find the perfect RV for your family! We're conveniently located at 44700 N I 94 Service Dr Belleville Michigan 48111, and we look forward to serving you! We also have personalized phone and internet service, and fast, 24/7 delivery anywhere in North America! So no matter where you live, we can still help you find your dream RV at a dream price and deliver it right to your door fast! Call us today at 734-439-3400! When you want to pack up and go, this Travel Trailer is always ready! It's so towable with a hitch weight of 536 lbs. and a rugged GVWR rating of 5125 lbs. Set up is easy, and the 14' 0" patio awning provides shade and UV protection for your family! If cooking is your hobby, or you just want to treat your family to a hearty meal, then you'll greatly appreciate the kitchen in this RV! It features modern cooking appliances and stylish cabinetry! Keep your fresh food fresh with the 8.00 cu. ft. refrigerator! The 3 burner range cooktop will have you sizzling up delicious dishes! Fill the 50 gallon freshwater tank for an abundance of clean water for refreshing drinks and easy dishwashing! The one great challenge with camping and long distance trips is the bathroom issue. Public restrooms and communal bathrooms are, more often than not, unclean and uncomfortable. That problem is a thing of the past with this RV, as it features a full bathroom with a shower and a Foot Flush toilet! 40 lbs. of LP tank capacity provides lots of hot water, and there is a 38 gallon gray water tank and a 38 gallon black water tank!